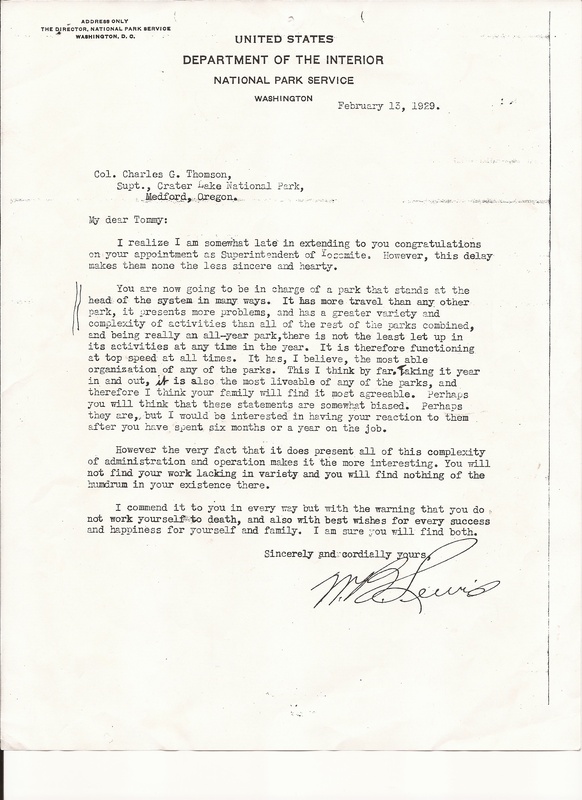 In a belated congratulatory letter to his successor as Yosemite National Park’s superintendent, outgoing superintendent M.W. Lewis counseled Charles G. Thomson of the inherent difficulties he would face running the park noting, “It has more travel than any other park, it presents more problems, and has a greater variety and complexity of activities than all of the rest of the parks combined, and being really an all year-year park, there is not the least let up in its activities at any time in the years.” This year marks the 150th anniversary of the Yosemite Grant. In celebration of the setting aside of the Yosemite Valley and Mariposa Grove in 1864 by President Abraham Lincoln, over the coming year I will share with you some of the more interesting documents and photos from Yosemite National Park’s archives. My plan is to impart some of Yosemite’s history in a roughly chronological manner, noting of course that right off I am abandoning any loyalty to telling a linear tale by beginning with a letter from in 1929. Superintendent Col. Thomson. Image from Digital Library of America. The year marked the beginning of Yosemite’s modernization. The park’s third superintendent, Thomson oversaw a number of construction projects that significantly changed Yosemite, including the building of the Wawona Tunnel, improvement of the Mariposa, Wawona and Tuolumne Meadows water systems, and the development of the ski area at Badger Pass. Such projects were in large part due to New Deal programs such as the CCC that pumped millions of dollars and man-hours into the development of the national parks, and others grew out of the growing popularity that parks like Yosemite created in conjunction with the arrival of the automobile en mass. Additionally, Thomson struggled over the growing importance of science in managing the park’s flora and fauna and how ecological concerns often time ran counter to tourist experiences within the park. Colonel Charles G. Thomson proved to be an ideal fit as superintendent to through the tumultuous period. 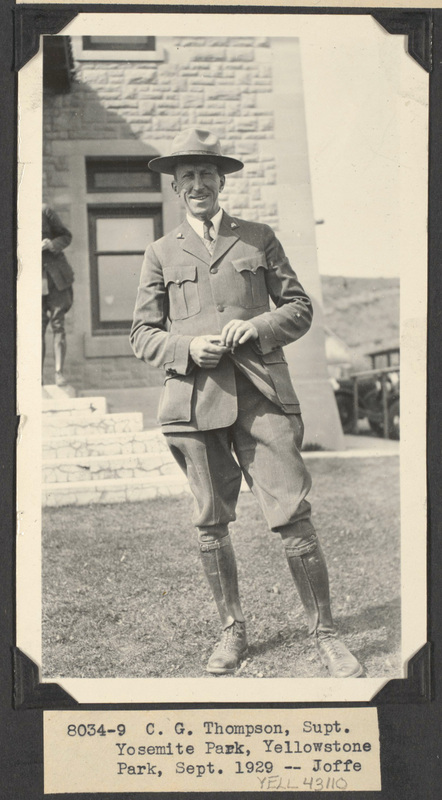 Educated at Cornell University as a veterinarian, Thomson entered the military in 1917, rising to the rank of lieutenant colonel in command of 2,600 officers and men at Lux, France. Then, in 1923, after retiring from the military, he joined the NPS and became the superintendent of Crater Lake National Park until his assignment to Yosemite. An accomplished writer, with several books and articles to his credit, Colonel Thomson loved the National Park Service. He died suddenly in 1937, still serving as Yosemite’s superintendent. The litany of challenges facing Yosemite that faced Thomson remains arguably the same today. Some four million visitors will pass through the park this coming year. Most will spend their time in the “Incomparable Valley” and the nearby giant Sequoia groves. Millions will make the short hike to the base of Yosemite Falls, and take in the sights from Glacier Point. Some will play a round of golf, sun themselves next to the pool, wander through the towering Mariposa Grove, or hit the slopes at Badger Pass Ski Area. Families will take in the sights, build a campfire, and allow their children to venture into the surrounding forests in search of adventure. Other braver souls will trek into Yosemite’s backcountry, scale its granite walls, or even soar over Yosemite Valley in a hang glider. This wide variety of activities proves, in some small matter I suppose, the enduring challenges in meeting millions of visitors’ ideas about how Yosemite should be experienced, enjoyed, and managed. The letter sets the tone I wish to establish for my exploration of Yosemite’s past. To understand Yosemite we must at first acknowledge its complexity, even revel in it. Over the course of the next twelve months I will, in some small way, prove a glimpse into the people and events that shaped Yosemite, and hopefully tell a few good stories along the way. I hope you join me in as I celebrate Yosemite’s rich history. Growing up in the San Francisco Bay Area, our family had several friends in and around the Yosemite area. Many a summer day were spent at swimming holes on the Merced River or places tucked back up in the woods near Mariposa. Yosemite was, for us, often a placed passed through or around but not often explored. The landmarks of El Capitan, Half Dome, Hetch-Hetchy Reservoir, and Tioga Pass all hold their rightful place in the nostalgia of my youth yet I admittedly know little else of this place. I look forward to your tribute to a place I have long taken for granted.